Researchers from AMOLF and Swiss EPFL have shown that the surface of minuscule water drops surrounded by a hydrophobic substance such as oil is surprisingly ordered. At room temperature, the surface water molecules of these droplets have much stronger interactions than at a normal water surface. This may shed new light on a variety of atmospheric, biological and even geological processes. Nanometric-sized water drops are everywhere—in the air as droplets or aerosols, in industrially produced medications, and within rocks and oil fields. To understand the behavior of these drops, it is necessary to know how they interact with their hydrophobic environment. This interaction takes places at the curved droplet interface, a sub-nanometric region that surrounds the small pocket of water. Researchers from EPFL, in collaboration with the institute AMOLF in the Netherlands have discovered that molecules on the surface of the drops were much more ordered than expected. Their surprising results have been published in Nature Communications. They pave the way to a better understanding of atmospheric, biological and geological processes. At EPFL, Sylvie Roke has developed a unique method for examining the surface of droplets one thousandth the thickness of a human hair, with a volume of an attoliter (10−18 liters). 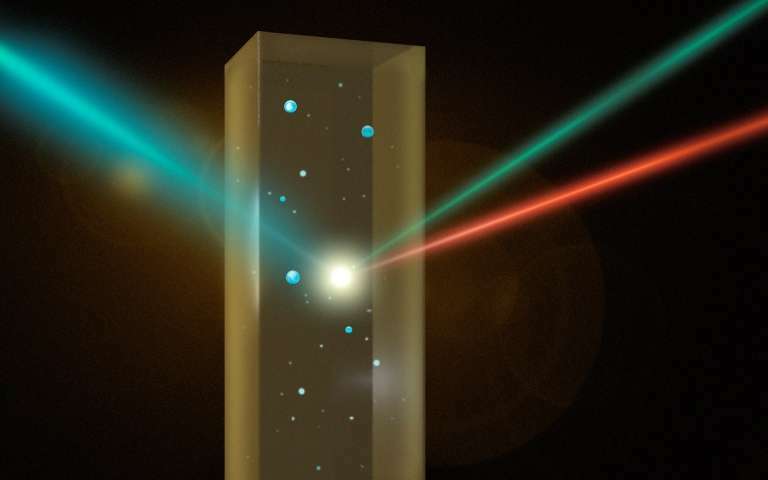 "The method involves overlapping ultrashort laser pulses in a mixture of water droplets in liquid oil and detecting photons that are scattered only from the interface", explains Roke. "These photons have the sum frequency of the incoming photons and are thus of a different color. With this newly generated color, we can determine the structure of the interface." 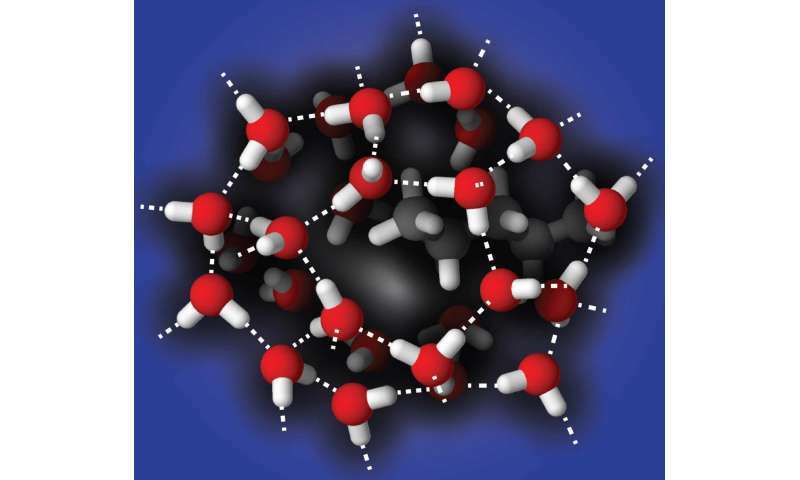 The surface of the water droplets turns out to be much more ordered than that of normal water, and is comparable to super-cooled water in which the molecules have very strong hydrogen bond interactions. In ice, these interactions lead to a stable tetrahedral configuration surrounding each water molecule. Surprisingly, this type of structure was found on the surface of the droplets even at the room temperature—50 °C above were it would normally appear. This research provides valuable insight into the properties of nanometric water drops. "The chemical properties of these drops depend on how the water molecules are organized on the surface, so it's really important to understand what's going on there," explained Roke. Further research could target the surface properties of water droplets with adding salt, a more realistic model of marine aerosols that consist of salty water surrounded by a hydrophobic environment. Salt may either enhance the water network or reduce its strength. "Or, it may not do anything at all. Given the surprising results found here, we can only speculate," says Roke. I'm surprised that nanoscopic water structure is still doing the rounds and is still a wondrous thing. There have been several publications on this since 2005 from the Bakker group (and including my own in PRL, JACS, etc. and not cited). Sylvie...I know you...and I'll find you! It might do some to enhance, or de-enhance, or nothing at all. How definitive. Anybody who is even remotely interested in this subject should read Pollack's Cells, Gels and the Engines of Life. It is clear that a huge mistake has been made with regards to the cell membrane and even how the body works on a fundamental level. Pollack found that in each discipline of biology he entered -- of three -- there were always less popular theories which were outperforming the established ones. He has since advised the world's largest funding agencies on how to fix their gatekeeping problem. When his recommendations were not enforced, he switched to mounting a campaign to set up his own funding agency to specifically target research that challenges textbook theories. He has his own peer review process that specifically addresses this particular problem. Whether or not he succeeds, I do believe his process for reforming peer review is groundbreaking.